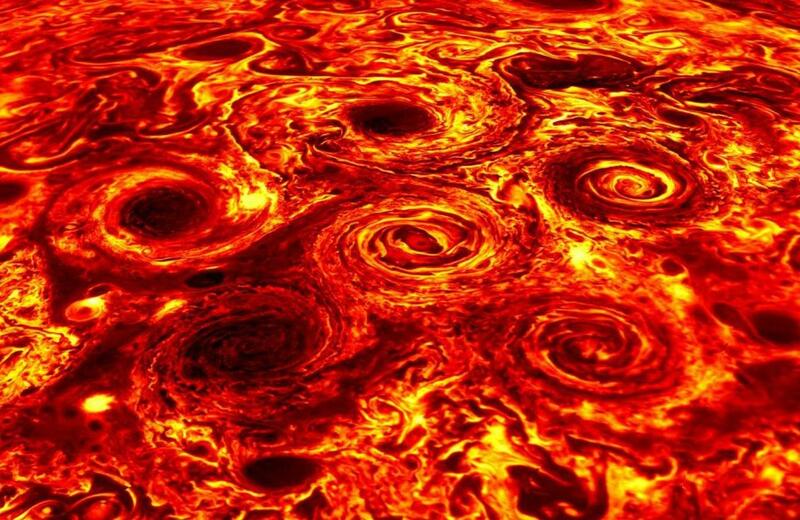 The Juno satellite has revealed Jupiter's majestic weather patterns in amazing detail. But is Jupiter really that dynamic with color? Turns out- no. But just because these images have "false color", it doesn't mean they're "fake news". How do you see into outer space? If you’re fortunate, you have a telescope to experience the majesty of stars, galaxies, and nebulae – or even relatively nearby planets such as the gas giants Saturn and Jupiter, and our smaller neighbors Mars and Venus. However, if you’re like most of us, the best available images of the heavens are the photos, videos, and illustrations presented by NASA and other space agencies. The images of outer space that grab our attention are taken by cameras that collect light from the widest possible spectrum – from infrared to ultraviolet – and convert it into data that is transmitted to Earth. Using that data, technicians create images that would otherwise be invisible to the human eye, so the colors we see differ (sometimes dramatically) from what we would perceive in the visible spectrum. the chemical footprints left in the atmosphere by elements and molecules. Do you kind of wish you could try your hand at data visualization from the comfort of your home? Well, guess what? You can! By connecting to NASA’s “Scientific Visualization Studio” (SVS), citizen astronomers and regular folks like us can select raw images and manipulate them to bring out illuminating details and important scientific data. To say that using the SVS is cool is really an understatement! Explore more about Juno's five year venture into space, and its groundbreaking discoveries in "The Jupiter Enigma" click here! You can also view raw images taken by the Juno spacecraft on “JunoCam,” the camera/telescope aboard the craft. JunoCam captures a target in full-color (red, green, blue) and near-infrared light. Data visualizers then combine the resulting four images, align the new image’s colors, and supply them to the public for “finishing.” This is where people with technical skill can produce images that reveal interesting processes of cloud movement and weather on Jupiter. Here are a few especially striking images of Jupiter’s complex cloud and weather patterns, as well as other phenomena. Remember: When enjoying these images, don’t let a little “false color” impede your appreciation for what you see. These views contain information from beyond the visible spectrum, so you’re getting a better look at these astounding sights than human eyes alone could see. In fact, you might describe the images as displaying “expanded color” for their incorporation of data from non-visible spectra. 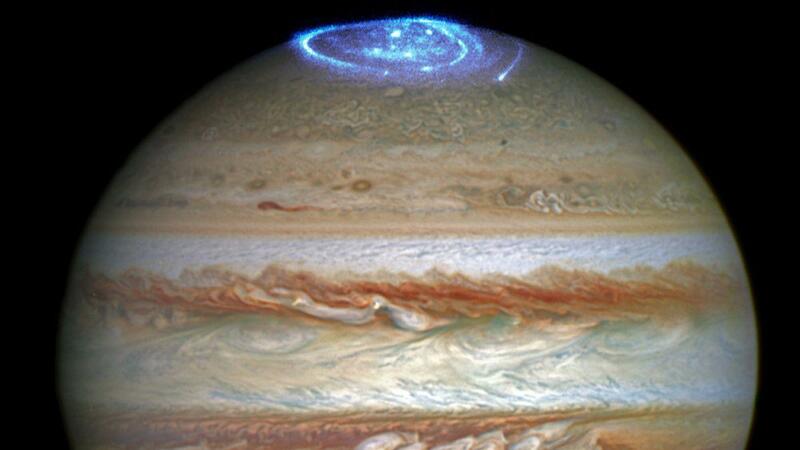 This composite image of Jupiter’s northern aurora was made with information from the Hubble Space Telescope that was recorded in ultraviolet light, the best light for viewing aurorae. Aurorae are the result of the Sun sending out huge gusts of electromagnetic energy that is deflected by the magnetic fields of planets such as Earth and Jupiter. It is this activity that causes such colorful displays in the visible and ultraviolet spectra. Juno was able to measure the solar wind that hits Jupiter and discovered that the enormous planet has a magnetic field that is twice as strong as scientists had previously theorized. Beyond observing that these polar cyclones look somewhat like fiery bouquets of roses, there’s still much more about them that scientists don’t yet understand, such as what drives the fierce storms that create these twisters, how they remain distinct from one another, and how long they last. 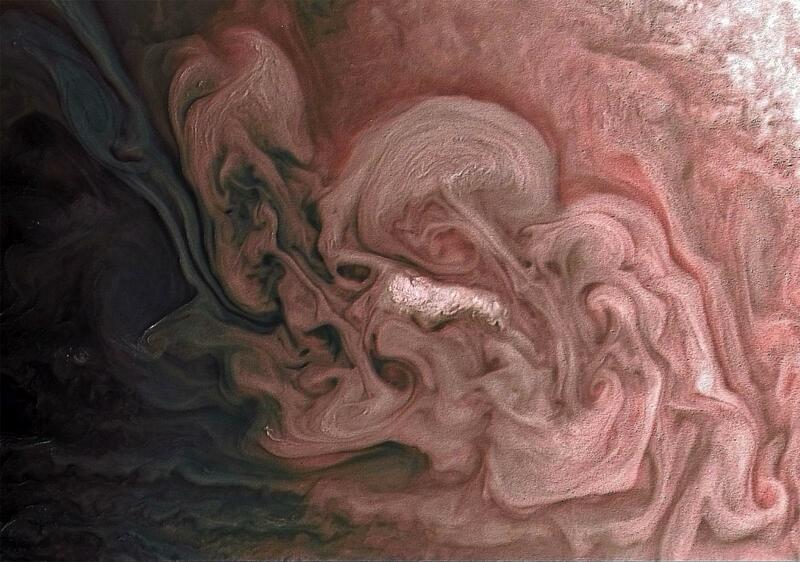 This color-enhanced image, which shows intricate cloud patterns in the northern hemisphere of Jupiter, was taken on April 1, 2018. It reveals detailed cloud formations on the northern hemisphere of the planet. The winds on Jupiter are so strong they influence the planet’s gravitational field. Juno has discovered that wind flows on the planet extend at least 3,000 km (1,860 miles) down below the cloud tops. At that depth, the atmospheric pressure is 100,000 times the pressure on the surface of Earth. At the center of this color-enhanced image is a storm with bright cloud tops in the northern hemisphere of Jupiter. The image was prepared using data from the JunoCam imager and then embossed to bring out surface detail. Juno’s scientific observations of the planet’s extremely deep gaseous atmosphere suggest that it could account for as much as one percent of the entire planet’s mass. That’s a far cry from Earth and our own relatively light atmosphere! Juno shot this color-enhanced image from about 5,000 miles above the tops of the clouds. It depicts a massive swirling storm above the temperate zone of Jupiter’s northern hemisphere. How long do these storms last? It could take a while to find out, as scientists believe they could last for months, years, or even centuries.